The third month of my elective was probably my favourite month of the entire of medical school. I first heard about the Wilderness Medicine Societies student elective in 2016 and knew from then on that I wanted to be a part of it. I have done a few weekend wilderness medicine courses before, during 3rd and 4th year so it fantastic to learn new things and reinforce previous knowledge and skills. I made sure I was 1st quarter elective so I would be able to participate in this course and applied for it the day applications opened. 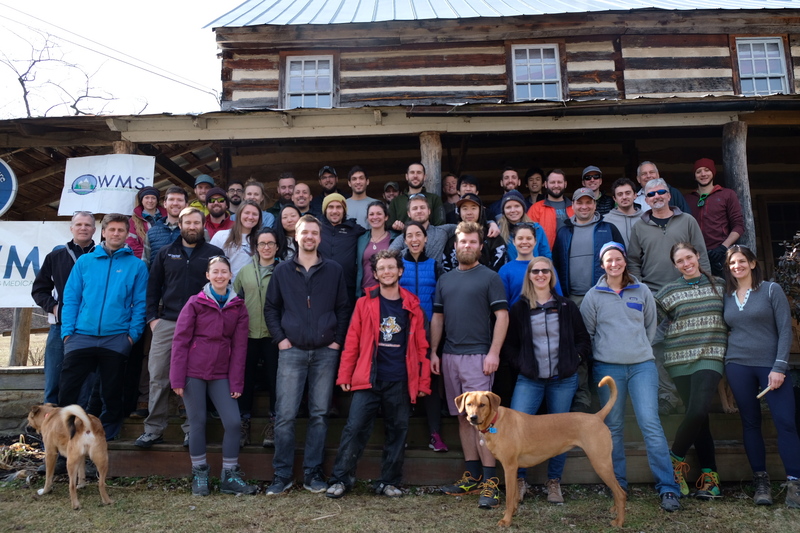 The wilderness medicine student elective is a four-week elective based at “Wilderness Adventures at Eagles Landing” in the George Washington National Forest in Virginia, USA. There were 28 final year medical students, many from the US and then a smattering of internationals including students from, Denmark, Great Britain, Brazil, Australia, Canada and myself from New Zealand. So, there was a wide variety of medical experiences and views on how healthcare is performed in different countries. We all lived together in a large log cabin for the duration of the learning segment of the course. The elective was split into four distinct weeks. The first week was almost purely lectures and team building. This was to develop a baseline of knowledge and to allow us to begin to get to know each other and get us working together as a team. Lectures included acute trauma management, burns, dive medicine and physiology, space medicine, toxic animal bites, polar medicine, high altitude medicine and many other interesting and eccentric specialties. In week two we began to integrate what we had been learning into practical application. This included learning how to do initial (DRS ABC) assessments and secondary screens on trauma patients. Once the simulated patients had been assessed we would treat them accordingly and set them up for transport, whether that was through splinting or putting the patient on a stretcher for extrication. During this week we also learned about and practiced high angle rope rescue and swift water rescue. Our third week was an official “Wilderness medicine first responder course.” This is a course aimed at those people who work outdoors in high danger areas, such as ski patrollers, search and rescue teams, firefighters, and paramedics. It was run by local instructors, who are doctors, paramedics and search and rescue personnel. The course was a continuation of what we had been learning throughout the elective and stepped things up a notch further. We received an official certification from Roane State Community College for completing the course. I was proud to be commended by Dr. Thomas Kessler who is very prominent in wilderness medicine research and was the first person to write in a journal on extra applications for EpiPen use. EpiPen’s give a dose of 0.3mg IM, this is useful for initial symptoms of anaphylaxis, and unfortunately, many people rebound and require extra doses. Dr. Kessler’s main reported findings were that with a multi-tool you can pull apart an EpiPen in about 5 minutes to get to the vial inside with at least 3 extra 0.3mg doses. After watching how he did this and carefully examining the EpiPen’s “anatomy” I felt that I could develop a quicker way to get to the extra doses and managed to do it in two cuts which take less than 20 seconds. He was very excited about my novel approach to accessing the remaining adrenaline and commented that this improvement on his technique could be crucial if the patient is in a critical condition. He said that from now on when he is running these courses he will teach my technique. I am incredibly honoured that a man of such high esteem will be sharing a skill I helped to develop. The final week of the elective was a combination of everything we had learned over the duration of the course. In groups of six, we had to organize and complete a self-sustained four-day, three-night hike in George Washington National Park. For this we were joined by two mentors, both of whom are local doctors and outdoorsman. Between us we had to establish a route, organize transport and have adequate gear, food and shelter for the trip. We decided to walk a 30-mile section of the Appalachian Trail from Reed’s gap to Hog camp gap. This section included the Three Ridges and Priest Mountain wilderness areas. During the hike our mentors would give us scenarios to run and try to manage with only the gear we had brought with us. Scenarios included anaphylaxis following a bee sting, splinting broken limbs, treating acute mountain sickness, resuscitating a drowned party member, a patient having an MI on the trail and dealing with severe hypothermia. This hike was a fantastic way to consolidate our learning and integrate it into real-world situations. During the elective we normally had teaching from 8 am until 5 pm or 8 pm with an hour or two for lunch and dinner. Most of us would eat lunch and get straight into our hiking gear to go exploring the surrounding wilderness. Activities during free time on weekends included long day hikes, going to the local rock climbing wall in Roanoke, going caving, completing a beginner scuba course and exploring all the local cuisine and craft breweries.